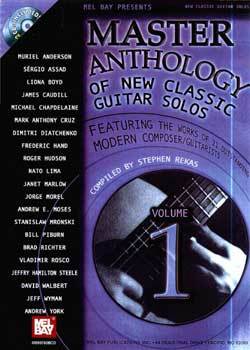 Master Anthology Of New Classic Guitar Solos Volume 1 PDF + Mp3 CD download. This collection presents original works by 21 modern-day composer/guitarists, including both well-known artists and gifted upstarts. Recommended for the intermediate to advanced player, with the exception of a few pieces in alternate tunings, the selections are written in standard notation only. Bio sketches, photos, performance notes and a CD recorded for the most part by the composers themselves complete this musical portrait of the classic guitar in the 21st century. Download Master Anthology Of New Classic Guitar Solos Volume 1 PDF free and other books from our site. Only high quality PDF scans. Please write a review, it's important for our community.